It was my favorite movie as a kid, it featured my very first crush, and while there have been many copycats, there will only ever be one Home Alone. I highly doubt that anyone reading a movie review blog hasn't seen this film by now, but those select few...The film centers on Kevin McCallister (Macaulay Culkin) a bratty kid, whose extended family is preparing for Christmas in Paris. During dinner, Kevin starts a fight with his older brother, Buzz, and is sent to sleep alone in the attic. 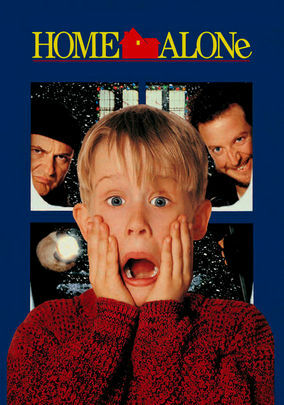 An overnight power failure leaves the family rushing to catch their flight and Kevin gets left home alone. At the same time, a pair of idiotic home invaders working his neighborhood and want to rob his house. Kevin sees himself as the man of the house now and knows its his job to defend it. As his parents rush to get back to him, Kevin prepares for war! Home Alone is the epitome of a family film and is what all family films aspire to be. These films all claim to be fun for the whole family, but lets face it, they're geared toward children. Most of the time you take the family to see them and twenty minutes in you're on your phone or falling asleep, but not here. The chemistry between Joe Pesci and Macaulay Culkin is fantastic. We all know Pesci for his mobster roles, so it's easy to forget that he got his start as a comedic actor, and it is actually what he does best. Paired with a great cast, a legendary director, and a terrific story, this is simply the best family feature film I have ever seen. Home Alone has something for everyone. It will make you laugh, cry, and beg for more, and that's why there are five god awful sequels and a whole bunch of other films trying to duplicate the magic of this film, but as I said earlier there will only ever be one Home Alone and it is an absolute must see movie!